Back on the 7th of July 1818, the then Governor of NSW, Lachlan Macquarie was laid the first stone of the Parramatta Female Factory which would eventually house at least 5,000 of the 24,960 convict women transported to Australia. Help the FPFF celebrate the laying of the foundation stone. Image courtesy of the FPFF. Two hundred years ahead, on Saturday 7th July 2018, the Commemoration of the laying of the foundation stone is to be held to celebrate & acknowledge the National significance of one the earliest and most intact female convict sites in Australia. A the end of the road where the scaffolding is where the old entrance was in 1883. Image by Gary Brown. So much history is in that clock tower. Image by Gary Brown. The Female Factory was a place of despair, hardship and riots, where their children were removed at the age of three, a labour exchange, a marriage bureau, a place of textile manufactory and it was from here that many of these women became business women, farmers, workers, teachers and mothers of our nation. Female convict were house in this building could have been from the ages of 9 to 82. Image by Gary Brown. The stories of hope, resilience and survival held in this place, are stories which go to the heart of the Australian Identity - it is a place of significant history with an estimated 1 in 5 to 1 in 7 descended from these women. 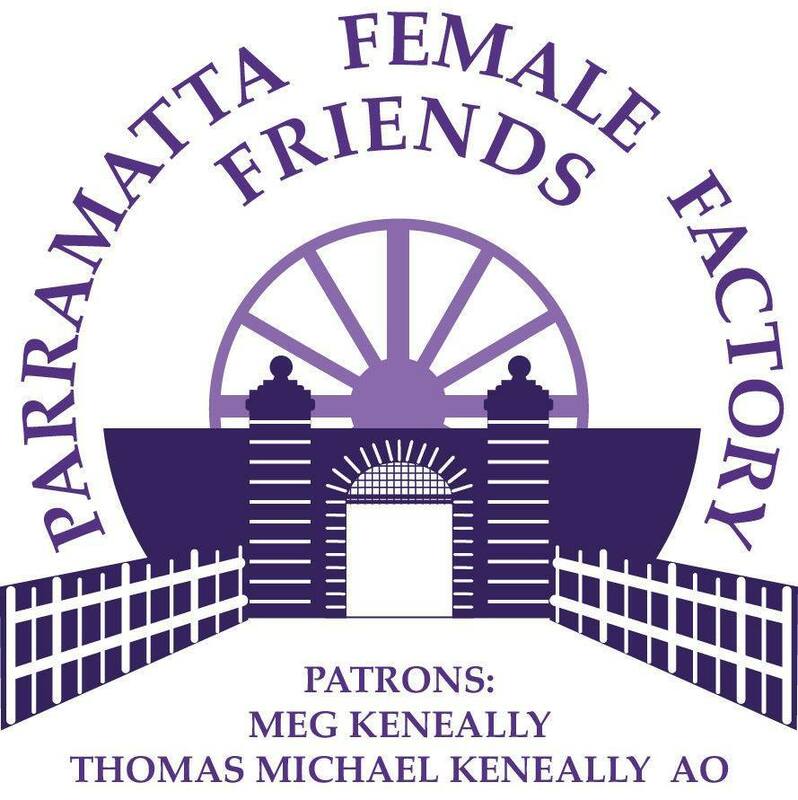 Many an article has been written about the female factory and the significance of what occurred there throughout the years and how it started off as the Parramatta Female Factory in 1818 to house women who came over on the convict ships to be then changed to in 1847 as an Invalid & Lunatic Asylum to now be operating as Cumberland Hospital. The lawn in front of this building use to be a bowling green. Image by Gary Brown. 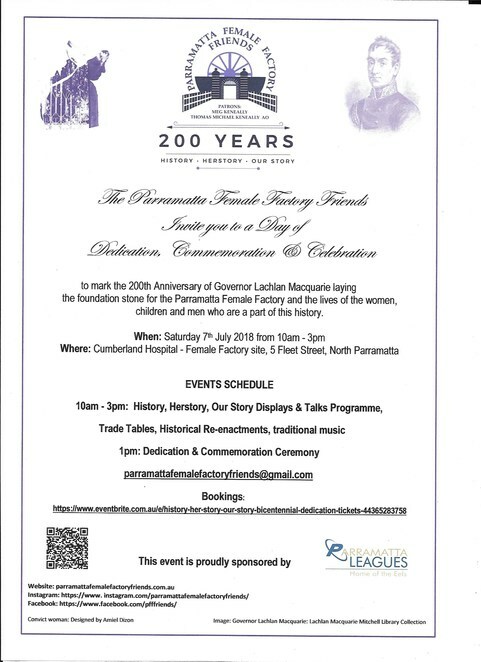 It is Parramatta Female Factory Friends Inc. that would welcome your support in commemorating the Bicentenary of this singular and most significant National Heritage site. Publicity & promotion on your social media platforms. Publicity/Promotion of the event in your publication. An exhibition or display of Macquarie related material from your archives to coincide with/support the Commemoration. Image courtesy from the FPFF. The Parramatta Female Factory Friends Invite you, family and friends to a Day of Dedication, Commemoration & Celebration to mark the 200th Anniversary of Governor Lachlan Macquarie laying the foundation stone for the Parramatta Female Factory and the lives of the women, children and men who are a part of this history. Why? Witness the laying of the foundation stone.